TORONTO, ON – A celebration was held today in culmination of the annual Tire Take Back program, a collaborative community fundraiser organized by the Ontario Automotive Recyclers Association (OARA) and the Ontario Tire Stewardship (OTS) with support from registered tire haulers and processors, and in association with the Ontario Federation of Agriculture (OFA), working together with communities across the province to raise money to support The Sunshine Foundation of Canada. Since 2009, Tire Take Back has successfully led to the collection and recycling of 510,285 used tires, resulting in a total of $1,115,921 in donations to Sunshine, and effectively providing hundreds of life-changing dream come true experiences for children living with severe physical disabilities or life-threatening illnesses. During the eighth annual Tire Take Back program held this year from May 23rd to June 4th, Ontarians recycled a total of 52,100 used tires, raising $54,528 in support of Sunshine. 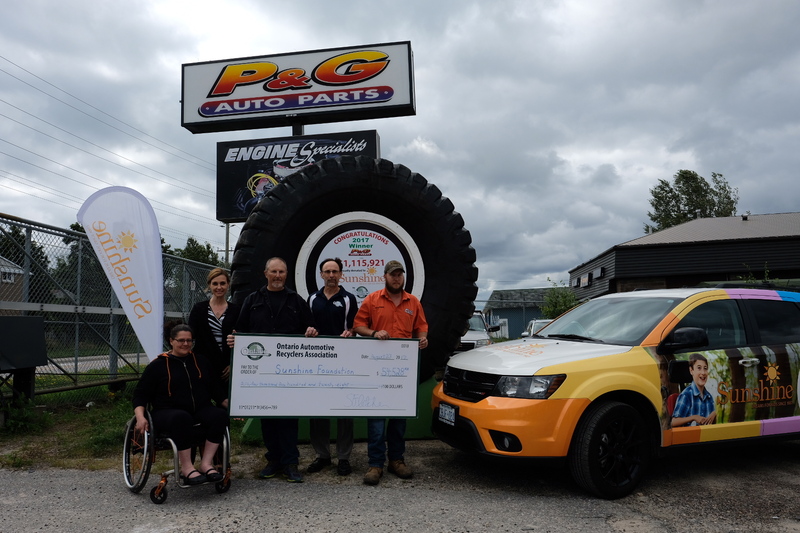 To celebrate this tremendous success, members from OARA, OTS, OFA and Sunshine gathered at P&G Auto Parts in North Bay, the recycler with the highest number of tires collected across the province, for an official cheque presentation and celebration of more dreams coming true. This year marked a significant increase in support from the farming community, with the highest number of agricultural tires donated during this campaign to date. This increase is due in part to the collaboration with OFA and their efforts to reach out to the agricultural sector across the province. The celebration at P&G Auto Parts, hosted by co-owner Darrell Pitman, was also an opportunity for Sunshine to give thanks for the combined efforts of all the stakeholders who came together to make a difference in the lives of children. The Sunshine Foundation of Canada is a national Canadian charity impacting the lives of children living with severe physical disabilities or life-threatening illnesses by making their dreams come true. Sunshine Dream Programs give children the opportunity to experience freedom from their daily regimens and challenges by transforming their dreams t into reality, impacting them with a sense of independence, confidence, and empowerment that will stay with them for the rest of their lives. Sunshine has two dream programs: Sunshine Dreams, which can range from family trips to meeting a hero to outdoor play-spaces, and Sunshine DreamLift which is a whirlwind ‘day of yes’ adventure to a Disney theme park for a large group of children. Since its inception in 1987, Sunshine has fulfilled more than 8,000 dream experiences for children across Canada and coordinated 62 Sunshine DreamLifts. For more information, visit sunshine.ca or follow us on Twitter: @SunshineFound. OARA members process end-of-life vehicles (ELVs) in an environmentally responsible manner, ensuring the environment is protected from potentially harmful operating fluids and toxins such as mercury and lead. Participating OARA Members are also registered Tire Collectors with OTS. oara.com. Established in 2009, OTS is an Industry Funded Organization (IFO) incorporated under Ontario’s Waste Diversion Act, to implement and operate the Used Tires Program. At OTS, we are transforming the relationship Ontarians have with the lifecycle of their tires, through a comprehensive approach that takes into account our environment, our economy and our quality of life. Through the Used Tires program, 100 per cent of Ontario tires get efficiently and responsibly recycled into new products, leading to more livable communities and a growing green economy in this province. To date, OTS has helped responsibly recycle more than 85 million tires in Ontario. To learn more, visit rethinktires.ca. The Ontario Federation of Agriculture (OFA) is the largest general farm organization in Ontario, representing 37,000 farm families across the province. As a dynamic farmer-led organization based in Guelph, the OFA works to represent and champion the interests of Ontario farmers through government relations, farm policy recommendations, research, lobby efforts, community representation, media relations and more. OFA is the leading advocate for Ontario’s farmers and is Ontario’s voice of the farmer. ofa.on.ca.